Your cat is likely to have a basic personality but shows different mannerisms from day to day. 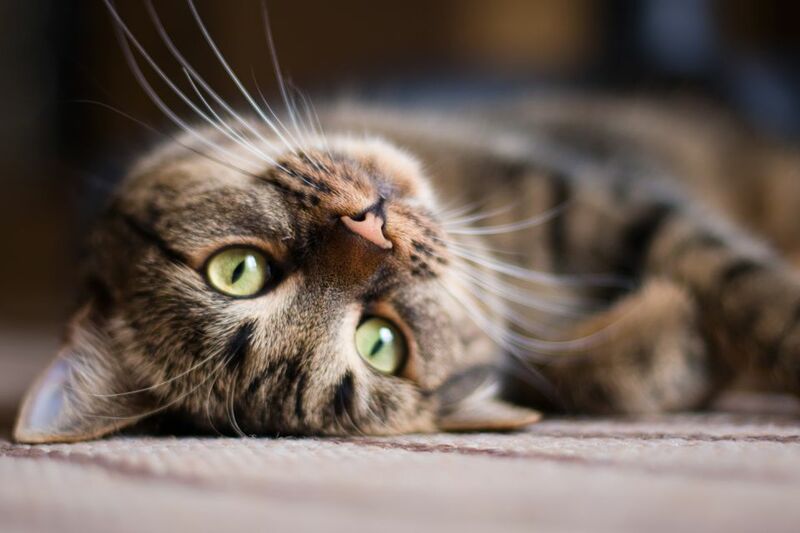 If you want to better understand what makes your cat tick, consider these factors that influence their personalities. It is only possible to fully know the genetics of pure-bred cats. Various cat breeds have been around long enough that their distinguishing characteristics such as body type and personalities are fairly consistent. Since cat breeders have made efforts to breed to type, colors within the breeds have also been consistent, according to breed standards. It is an interesting aside that colors in cats sometimes carry personality traits too. Personalities within a given breed remain fairly consistent, other factors aside. As an example, the Cat Fanciers Association Persian Cat Profile describes its personality as "sweet," "gentle," and needing "an atmosphere of security and serenity." Since the vast majority of pet cats are of the domestic or mixed breed variety, environment is the single most important factor behind their personalities. The single most important environmental factor for cats in their home is "What is the overall mood of the home?" A home where the human family members' interaction is normally on an even keel, whether it be quiet and harmonious or noisy and happily active, is the most desirable atmosphere for cats. One of the things cats hate the most is change of any kind, and that includes changes in attitudes from day to day. If the humans are happy and active one minute, moody and distant the next, and perhaps arguing loudly the next, the cats will reflect these changes according to their own personalities. A shy, withdrawn cat may hide under the bed for days. A normally active cat may suddenly turn on his favorite feline housemate—sort of a variation on the redirected aggression syndrome. Strangers coming and going, such as new visitors or repairmen. A new cat or kitten into the home. Illness in the home, whether it's a sick human member or a sick cat, it is a change for all the cats. A sick cat may become depressed. The surviving cats will mourn the loss if one dies. Conversely, if the human family members are for the most part on an even keel, although it is not an automatic guarantee of peace within the cat population, the cats will feel free to interact according to their own temperaments. Cats are fastidious creatures and don't tolerate dirty litter boxes or spoiled food. Untidiness is one thing, but a dirty, stinky house is entirely another. In that kind of atmosphere, most cats would become withdrawn, depressed, and likely physically sick. On the other hand, a clean home (not necessarily tidy), with nutritious food, cool, clear water, toys, and scratching posts, lays the foundation for happy cats, all other things being equal. A cat's history plays a large role in his or her personality, as well as behavior. With most purebred cats obtained from a cattery, a complete pedigree going back several generations will be part of the purchase price. History is not just a pedigree, though; certainly, a purebred cat purchased from a backyard breeder (kitten mill) will have a much different personality than a cat raised "underfoot" in a reputable breeder's home. With domestic cats, many of whom may have been found on the street, or adopted from animal shelters, often very little is known of the cat's history. A cat may have been in an abusive situation. He may have been loved by someone in his previous family, but someone else decided to get a dog, and the cat had to go. Or, the previous owners may have been evicted or had their house foreclosed by the lender. In these cases, it is not unusual for them simply to leave the cat behind or drop him off at the shelter. Any combination of the above factors will have an effect on the various personality traits of the cats within a given home. A cat who was abused in a previous home will likely require special nurturing, but may eventually become a well-rounded cat with a sweet, loving personality. If he is dumped into a disorganized, dysfunctional atmosphere, or a home with numerous stress factors, he may always be a "fraidy cat." Most multi-cat households have a pecking order, which may change from time-to-time and even day by day. The Alpha Cat: Alpha cats exert their dominance over the other cats in the household. This can lead to aggressive encounters when another cat is a threat to its dominance. The cat may exhibit hissing and swatting or an out-and-out attack. Alpha cats also try to exert their dominance over their humans, which is a tricky situation. While you do not want to be a bully, neither can you allow a cat to bully you. Removal of privileges is a good training technique here (one privilege being our company.) It teaches the cats cause and effect, e.g., "You bite me when I'm petting you, and you get no more pets today," or, "You try to hog up the food dish; you get locked up until the other cats have eaten." The Beta Cat: Usually second in line to the alpha cat is the beta cat, although this doesn't necessarily mean the beta cat aspires to be alpha. When the alpha cat is out of the room, the beta cats may try to establish secondary dominance. Can you ever figure them out? You will never understand them fully. They are a rare source of unconditional love, something humans crave. Your life would be empty and boring without them.